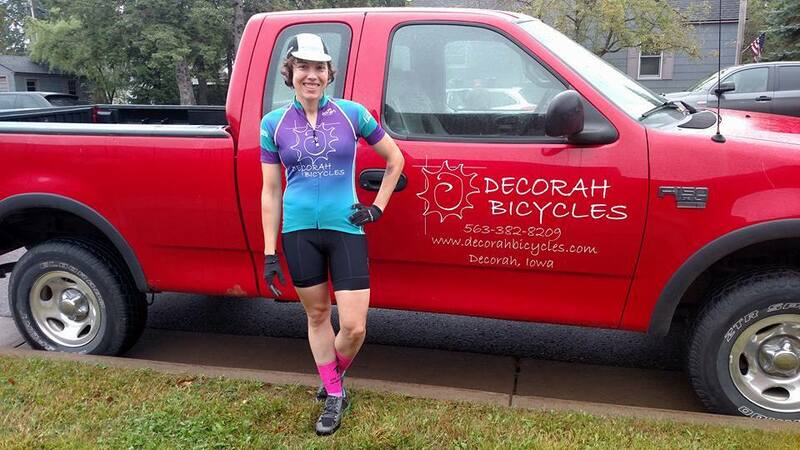 Josie's Bike Life: Decorah Bicycles/FWD Jersey: Coming Soon! 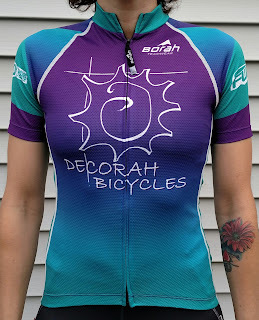 Decorah Bicycles/FWD Jersey: Coming Soon! 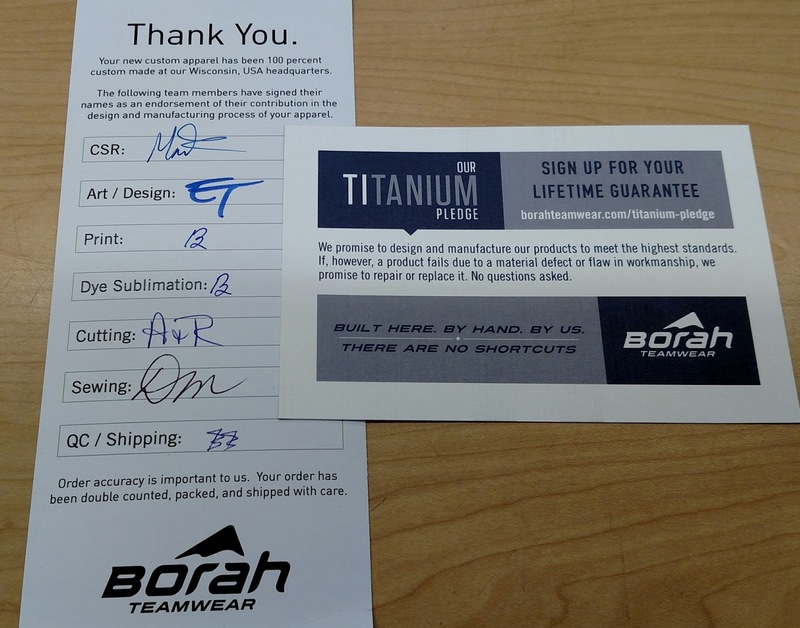 First off, I have to thank Borah Teamwear a thousand times over for their generosity and fabulous customer service. 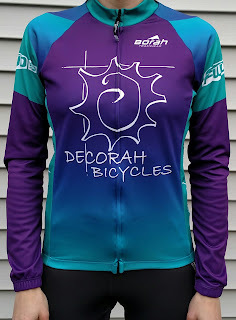 Because of this, Decorah Bicycles will be having new shop jerseys made by this wonderful company based out of Wisconsin. Not only will we have a colorful option that will be great for visibility/style purposes, but this will be our first shop jersey offered in both a men's and women's cut! The jerseys will be full zip, and we plan the women's cut to be without the elastic waist band. I have been wearing the Pro cut of the short sleeve jersey (which is tighter than the Team cut) and I have found it to be very comfortable and have received so many positive comments about it! The Team cut will allow for more versatility with sizing- if you want a tighter fit, size down. If you want a looser fit, size up. Otherwise, stick with your usual size for a mix! For the size chart, click here. 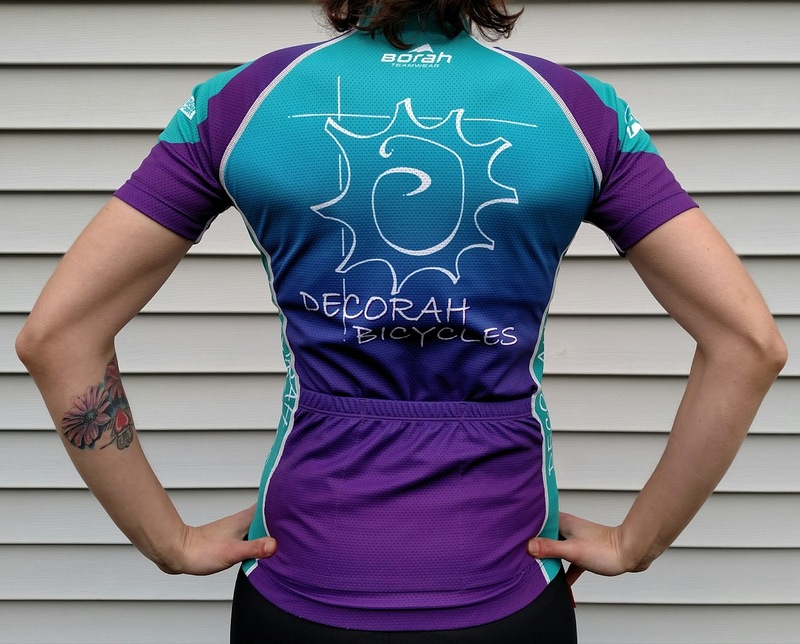 Decorah Bicycles is encouraging folks who are interested in purchasing the jersey to let them know what their size and style (men/women) preference is so there is plenty ordered. Regardless of how many people pre-order, they will be placing an order- however if you are an XS or a size larger than XL, then it would be helpful so quantities can be figured. 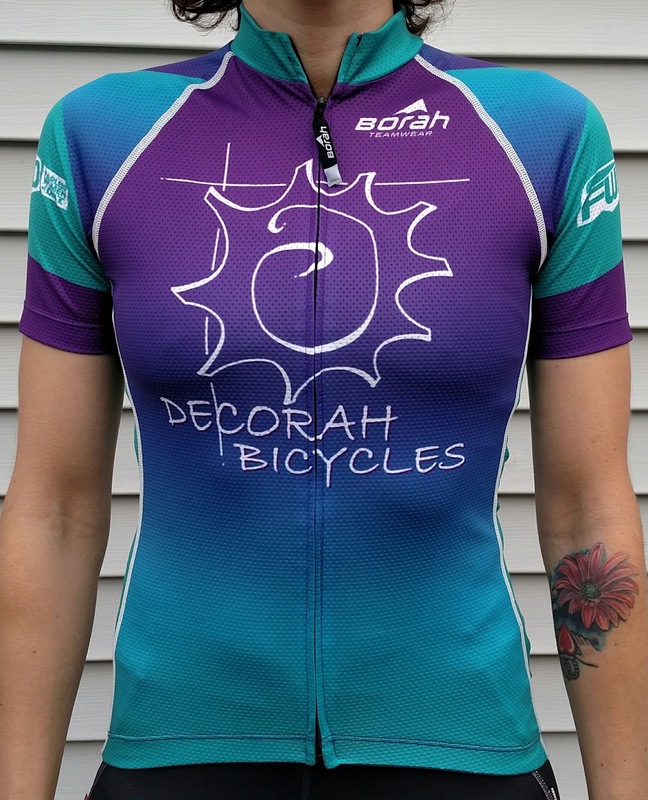 Decorah Bicycles is very excited to be working with Borah on these jerseys for several factors. One, they are a local company! Being a small brick and mortar bike shop, supporting local is something that they try to do on a regular basis. Second, the customer service has been outstanding. Third, they offer their Titanium Pledge- a lifetime guarantee against any material defect or flaw in workmanship. Fourth, you get to see who had a part in making your jersey! They are very community-focused in their workplace and they want to share that with you. Everyone who had a part in the product signs a card. This came with my orders and I must say- it really makes you feel special when you see human signatures on a card detailing who did what! The SS Team jerseys will be ordered late December/early January regardless of pre-orders. However, if you want to be guaranteed your size, it's best to pre-order! I have been able to experiment with my long-sleeved jersey and I have to say, it's been outstanding in terms of the versatility. I will definitely be wearing this next spring, fall, and early winter (depending on temps.) Wearing solo would be fine on days that are warmer where you still need full-arm coverage but do not need a base layer. November 18th I was able to sneak out for a ride in the morning when it was 54 degrees and I wore a light wool base layer and the jersey- it was plenty warm and comfy! The material wasn't super thin, which I liked. Days where it's in the mid to lower 40's, I wore a warmer base layer and the jersey and felt comfortable. If windy, I would wear a wind vest or something to cut the chill. All in all, for 5 dollars more you get a jersey that you can wear during 3 out of 4 seasons! The jersey I purchased was an XS based on the unisex sizing. It is full-zip, so if wearing layers, you can easily unzip to cool off. Very handy. Needed: 15 pre-orders of the long sleeved jersey to make it happen! If this is something you would enjoy having- we want to make it happen! Cooler weather is upon us and this would make an excellent layering piece. 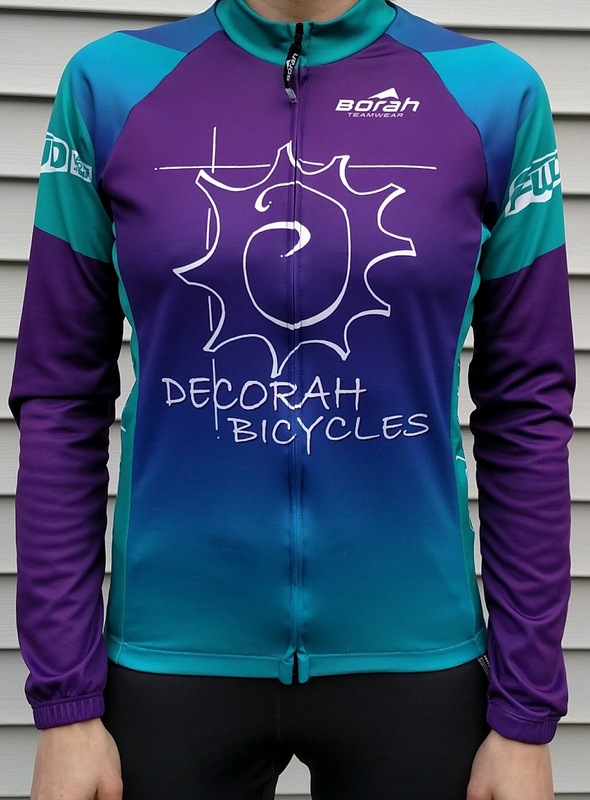 Also note- Decorah Bicycles is more than happy to ship out jerseys as well if you do not live in the area. Add $4.00 to the cost of the jersey and you'll be set! 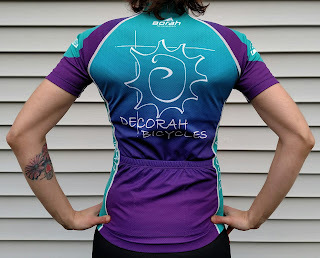 These jerseys are not only showing support for Decorah Bicycles, but the Decorah-based women's off-road group: FWD-Fearless Women of Dirt. 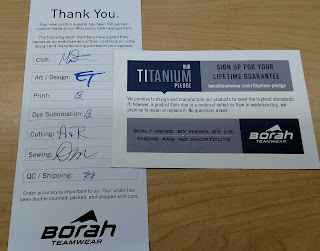 Check out Borah Teamwear on Facebook! Would you be interested in a Thermal Winter Jacket that would be perfect for winter riding and also custom made by Borah? Decorah Bicycles can get the ball rolling if they have 5 committals. The jackets retail for $165. Here is what Tad from Borah has to say about the jackets: "I love our jackets! I mean I love almost everything we do but our cycling jackets are maybe some of the nicest riding jackets I have ever had on. They are not waterproof but other than that they are warm, comfortable, long enough in the sleeves, short enough in the waist... just a great fit. One of those things you throw on and you completely forget that you are wearing it!" For pre-orders or further questions you can comment on the blog, call Decorah Bikes (phone number is on website) or fill out the contact form found here.